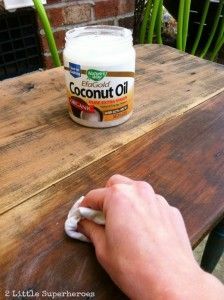 I found this tip on Pinterest on using coconut oil to refinish furniture. And decided to try it on some of my vintage wooden kitchen utensils. They looked very dry. I rubbed some coconut oil on with a paper towel to the bottom of this masher. What a difference! The coconut oil brings out the gorgeous grain and wood tone. I let them dry overnight, or soak in overnight, and they are not greasy or smelly. I put the utensils upside down inside a crock, kind of like a "utensil" bouquet. The wood color is so rich, and matches well with this little bench. The theme of my early fall mantel is grapes and pears with crocks. The dark wood sets off the neutral tone of the crocks and the fall harvest print. Here is the vintage ceramic canister set I purchased recently for $6, showcased in a wood crate. A vintage framed is tucked behind the harvest print. just so perfect for Fall, love the wonderful canister set!! Looks really good! 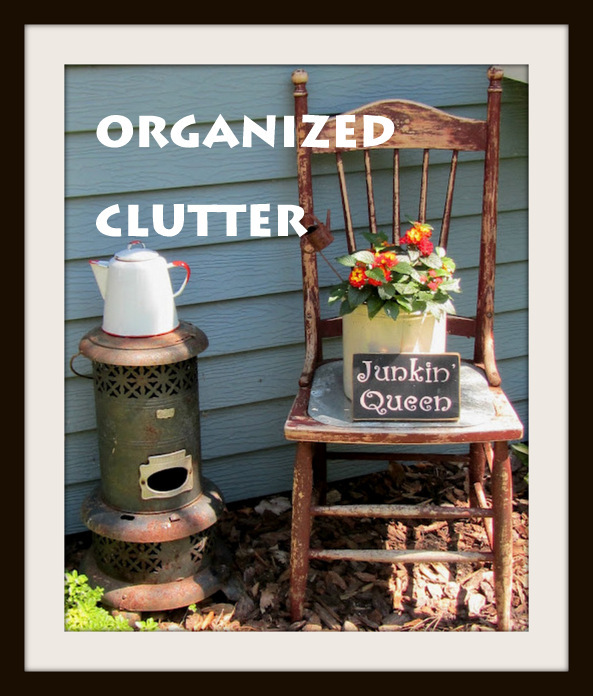 Great items you grouped together! Love the use of the crate, and the bouquet of kitchen utensils! Great idea, I have some vintage kitchen tools that could use some sprucing up as well. Wow the coconut oil really makes the wood shine and brings back the original color. Where did you purchase it at? It looks lovely for fall, but since we just got our summer weather on my part of the coast, I am not ready for fall. By the time it has arrived, everyone will have shown me great ideas. Hi Crlene, so happy you're back! Oh, I have got to try that. I have so many wooden things that could use a pop!! Love the utensil bouquet & the tip about the coconut oil is awesome. I will have to give that a try! So wonderful. The coconut oil really made them pretty. I love your canisters too. Great vignette. Have a great holiday week end. Oh so pretty! I really like the pear theme, too. I love coconut oil. I eat it and use it as a moisturizer. It's lovely! I have never heard of that tip! Thanks for sharing it! Great tip. Who would have thought? Thanks for sharing the coconut oil tip.....I have some vintage wooden items that can sure benefit from a good dose of that! Love all your pretties grouped together! Wow Carlene what a huge difference. The look so reach and I think it brings out their beauty more!! That is a good tip for coconut oil. I use it to condition my hair, too (wash out of course. Your mantel would be pretty for any time of year! Another thing you can do after applying the coconut oil is put the wood in a warm oven. The warmth will open up the grains & allow the oil to penetrate more fully. Love me some coconut oil! Can u add this to stain wooden utensils you use in the kitchen rather then only decor items? I have mine displayed on my counter in kitchen in a large crock but use them. I can say the look of them darker is very appealing.